One of the drawbacks of homeschooling is that students tend to miss out on some of the events our culture associates with adolescence. Many homeschoolers miss out on proms, homecoming games, after school clubs and pep rallies. But homeschoolers are also resourceful and come up with creative alternatives. Our area holds a homeschool prom every year, for example, and there are two different, rival homeschool athletic organizations providing opportunities to play varsity sports. 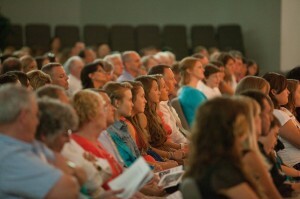 My favorite homeschool event each year, however, is our graduation ceremony. My church hosts the event and opens it to homeschooling families in the church and those involved in two affiliated homeschool programs. Over the past ten years or so, the graduating class has been as small as seven and as large as twenty-six. Parents of graduates put on the event each year. In fact, we had our first meeting for the 2015 graduation last week. The nice part is that we’ve been doing it for years and previous parent boards have compiled a helpful notebook that gets passed down each year with schedules, reminders, recommendations and checklists. It gets easier and easier. I’ve had family and friends attend the graduation and they always rave about how meaningful it is. I agree. Even when my own students aren’t marching, it’s rare that my eyes stay dry throughout. Graduates send out invitations in advance just like awayschoolers do. The event is usually held on the first Saturday in June at about 1:00 in the afternoon. Family and friends arrive and take their seats in the auditorium. Because the classes are so small, they can invite as many as they like, so we typically have several hundred in attendance. The graduates march in to “Pomp and Circumstance” in their caps and gowns (We rehearse the event on the previous night). They take their seats on the stage. A master of ceremonies welcomes everyone and someone begins with an invocation. This is followed by a commencement address by a guest speaker. This year we will have the mayor of our city — who asked for the opportunity to speak. He is a well-liked friend of the family of one of the graduates. Our commencement speakers are rarely so prestigious. We ask our guest speakers to keep the address brief — no more than twenty minutes — and they are typically obliging. The event can drag on if we don’t watch the schedule. There’s no valedictory address in a group of homeschoolers, so this year, in lieu of that, we are holding a speech-writing contest among all the graduates. The winner will present his or her speech following the commencement address. The graduate address will be limited to ten minutes. The presentation of diplomas, the heart of the ceremony, comes next. It’s the best part. The graduate’s name is called and while his family — parents and siblings usually — make their way on stage, the lights dim and a 45-second slide show is presented. Each graduate is responsible for creating his or her own slide show, music included. They typically start with baby pictures and progress through their most recent senior portraits. They are short, but they can be tear-jerkers. 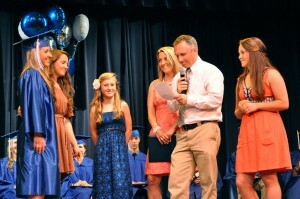 The parents then present the diploma to their graduate. This is appropriate of course because they are the ones who have overseen their education. They get a firm two-minutes to make some comments. Usually the dad does the talking because Mom is too emotional, but its up to the family. Sometimes they both encourage, reminisce, and congratulate. They present the diploma, hugs ensue, and the next graduate is called. It’s hard to describe how powerful those few moments can be. A homeschool graduation is the culmination of significant sacrifice and labor on the part of the student, the parents, and often the whole family. Though the presentation is appropriately public, the comments are precious and personal. Once all the slideshows and diploma presentations are completed, we run a final slideshow that includes individual senior photos and a group session a local photographer (who happens to be my wife) does for us each year. It concludes the presentation part and depicts the graduating class as a whole. Then the graduates stand, move their tassels, toss their caps, and march out to thunderous applause. For many, the reception after the ceremony has become as important to the event as the ceremony itself. Each graduate creates a personal display on a table around the lobby’s circumference. They cover tri-fold displays with pictures and stack the table with personal items like favorite books, trophies, and memorabilia of their school years. They also typically include a notebook so guests and fellow graduates can write their personal congratulations. 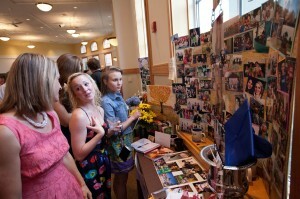 The graduates, especially the girls, take their display seriously. They can be pretty impressive. There are light snacks and guests typically linger for an hour or two, chatting with the graduates and admiring their displays. I’ve been a public and priva te school educator for years and have attended many graduation ceremonies. 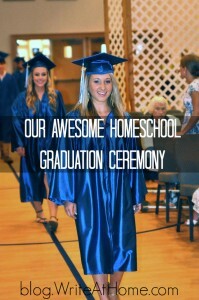 I am always happy to go in order to honor my graduating friends and their families, but I must admit that our homeschool ceremony is the only one I actually look forward to each year. This is very similar to our association’s graduation. Normally there is a speaker (a youth pastor or someone like that), but we don’t have student speakers. 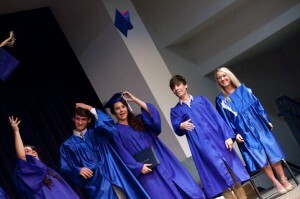 It varies, but the slide show and diploma presentation usually is 5 min total per person. Some parents talk too much, and sometimes the slide show goes on too long, but most people agree the slide show is the best part. The MC has been the current president of the association—often a graduate’s dad. At the end of the ceremony, each graduate marches out with their own chosen exit music excerpt. Our largest class was 16, but last year’s was 5.